While cars and trucks are often blamed for air pollution, it’s time to bring ships into the equation. The maritime sector—mainly ships and ports—contributes a large share of air pollutant emissions in coastal cities and casts a deathly pall over coastal communities. Ships are the particularly noxious sources of sulfur oxides, nitrogen oxides, fine particulate matter and other air pollutants that are bad for human health. Shipping represents about 15 percent and 13 percent of global nitrogen and sulfur oxides from anthropogenic sources. China has taken notice by incorporating maritime emissions into its national five-year-plan for transportation. As the world moves toward a cleaner economy, port cities and coastal nations will watch closely to see if China’s policies are effective at reducing maritime emissions. In major port cities, shipping activities represent a substantial share of total emissions—for example, around half of sulfur oxides in Hong Kong, Los Angeles and Shenzhen. Ships also contribute to more than 8 percent and 11 percent of sulfur oxides and nitrogen oxides, respectively, in Chinese coastal cities. It is significant enough to raise the awareness of coastal emission control. These emissions put a city’s development at risk. Increased illness and premature death caused by air pollution reduce quality of life, as well as labor productivity. Pollution also makes cities less attractive to talented workers, thereby reducing cities’ competitiveness. There is a strong link between air pollution exposure and cardiovascular diseases, such as ischemic heart disease, stroke, chronic obstructive pulmonary disease and lung cancer. Children, the elderly and the poor are the most vulnerable groups. Air pollution caused 5.5 million premature deaths worldwide in 2013, costing $5.11 trillion in welfare losses around the world—and that may be a conservative estimate. The ship pollution has taken a toll on global coasts. 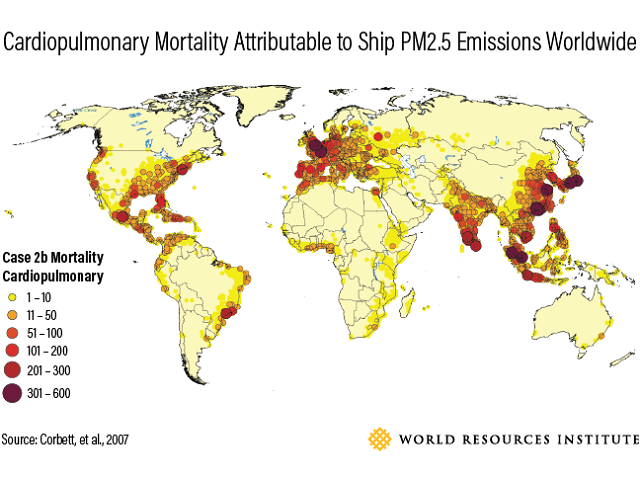 In 2013, ship emissions led to more than 24,000 premature deaths in East Asia, with 18,000 fatalities in mainland China alone. However, studies of the health impact of global shipping are still limited. Greening ships and ports is a plank of the Ministry of Transport’s 13th-Five-Year Plan. 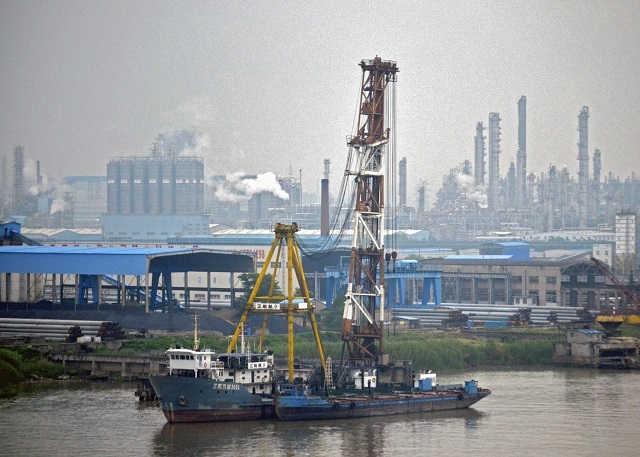 It declares that by 2020, ship sulfur and nitrogen oxides and particulate matter emissions should be reduced by 65 percent, 20 percent and 30 percent respectively, relative to 2015, in China’s three most prosperous coastal regions – Pearl River Delta (PRD), the Yangtze River Delta (YRD) and Bohai Rim. Introduce domestic emission control areas (DECAs): China is setting DECAs in its three major coastal regions, requiring ships to use marine fuel of no more than 5,000 parts per million sulfur content through 2019. From 2020, the government will consider stricter requirements of 1,000 parts per million sulfur content, and to extend the geographical scope of DECAs. However, it is still behind the schedule of the existing DECAs set by the International Maritime Organization. Draw cleaner power from the shore: China has been encouraging shore power—the provision of electricity to a ship at berth from a source on land—in recent years. This allows ships to shut down dirty engines while drawing cleaner electricity while they can. 493 berths will be equipped with shore power by 2020, and the government is subsidizing implementation. Switch ships to cleaner fuels: Right now, most ships are powered by heavy fuel oil. But, by 2020, China aims to double its LNG-fueled vessels, a move supported by adding LNG facilities to port terminals. Connect seaports with railways: Freight right now is unloaded from ships and carried inland mostly by trucks. Trucking, an emissions-intensive process, could be avoided if railways were directly connected with ports and operations synced for greater efficiency. In recent years, WRI China has focused on promoting low emission zones not only in urban land areas, but also in coastal areas, researching how to reduce emissions from ships. What we see so far is that this not only requires better policies, technologies and financing solutions, but also knowledge and awareness from China’s government, industry and the public. As the first step, we have developed guidelines to evaluate emission inventories and the social impact of maritime air pollution. By working with partners, we are conducting a training program in several Chinese cities, such as Qingdao and Guangzhou, with the aim to test our methodologies and influence policies with science-based evidence, and finally seek to scale our efforts regionally among maritime stakeholders and achieve a healthier coastal environment. Su Song is a Research Associate in the WRI China Office. How Did Shenzhen Build the World’s Largest Electric Bus Fleet?